Two cyclists head west on 34 from Riverside Drive, where a separate bikeway is being built. He was referring to the bikeway ODOT is having built on the north side of Highway 34 east of Corvallis. The path is part of a $3.38 million contract with Delta Construction of Eugene to make improvements on this busy highway. 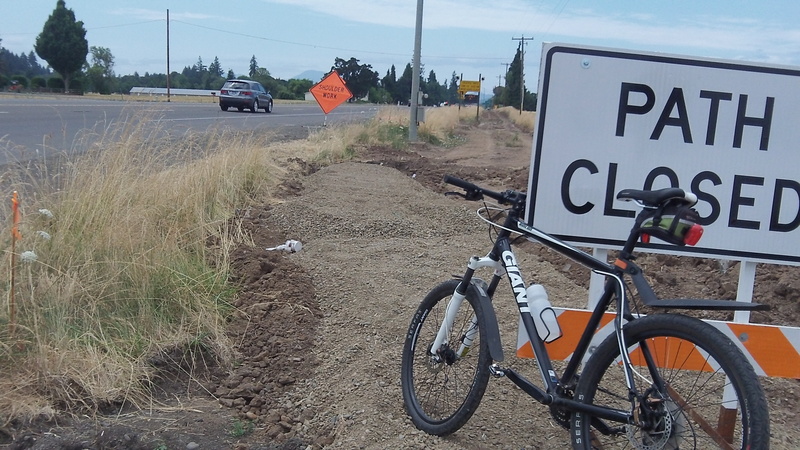 The main job is providing dual right-turn lanes from the Corvallis bypass going east. Work has been under way for a couple of months and is expected to wind up by the fall. The bikeway will take bikes off the highway shoulders — and away from freeway-speed trucks and cars — between Riverside Drive and Corvallis, a distance of about three miles. That’s a big boon to every highway user as far as safety is concerned. It’s not true that bikeways benefit only cyclists. Consider all the grief — not to mention legal consequences — facing a motorist who hits a cyclist by not paying attention for a split second and veering onto the shoulder. 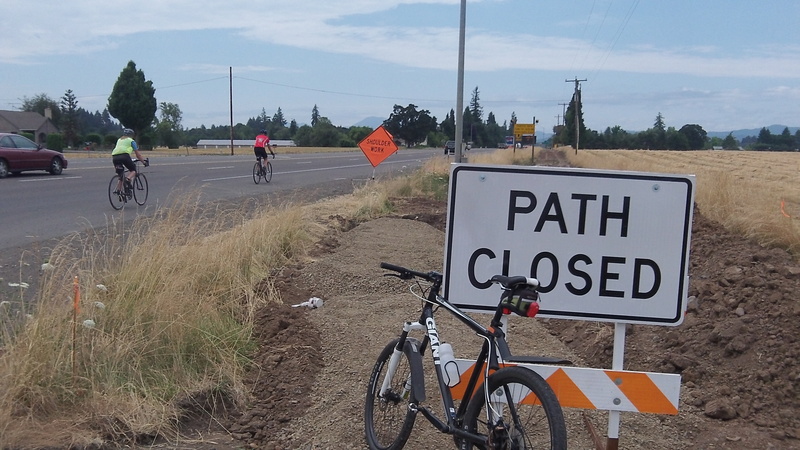 When the path is finished, it will be up to Linn Country to complete this new Albany-Corvallis bikeway link by widening the shoulders, where necessary, along Riverside Drive. The county plans to do this on the segment from Oakville Road to Meadow next year, assuming various wetlands and right-of-way hurdles can be cleared. “Closed”? “Under Construction” would be more accurate.